3 Bedroom Detached House For Sale in Salisbury for Guide Price £475,000. Netherhill Thatch is a stunning example of a ‘chocolate box cottage’, dating from the early 1800s with a thatched roof and now listed Grade II. 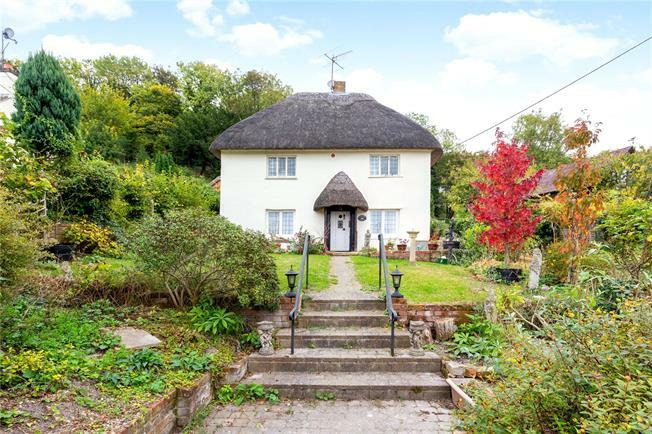 Entered via a wooden porch with matching thatch, the property retains many charming period features and has much character including leaded light windows to the front, exposed beams, beautiful internal wooden doors and a recessed fireplace. With the benefit of three reception rooms with good ceiling heights, the property is deceptively spacious. The dining room has a beamed ceiling and is ideal for entertaining being adjacent to a well-designed kitchen. With space for a breakfast table ideal for family meals, the kitchen is fitted with a modern range of matching wall and base units topped by granite worksurfaces with integrated dishwasher, oven and hob. With a delightful sitting room featuring an attractive beamed brick fireplace with open fire, the accommodation has been further improved by the addition of a modern family room to the rear. This lovely room features a vaulted wooden ceiling partially glazed and with patio doors allowing good natural light to flood in. Beyond this is a shower-room with WC and storage cupboard. There is additional storage beneath the stairs which leads to the first floor. Here there are three bedrooms, two of which have lovely views to the front over the village and valleys beyond. Completing the accommodation is a family bathroom with part tiled walls and a Jacuzzi bath and separate shower cubicle. The village of Pitton lies about five miles to the east of Salisbury and is most picturesque and surrounded by rolling countryside. Located in the centre of the village which offers a range of facilities including a popular primary school, general store and Post Office, thriving village hall, historic church of St Peter, sports fields and tennis courts and a well-regarded public house, The Silver Plough. Salisbury offers comprehensive range of recreational amenities, shopping facilities, market days on Tuesdays and Saturdays and a wide range of schooling, both state and private, including two grammar schools. TRAIN SERVICES: Mainline stations can be found in Salisbury and Dean serving London Paddington and Waterloo. Although a rural environment, there is easy access to the A30 and the A303 to the north to Southampton via the A36/M27 to the south. With a good sized and delightful front garden which is landscaped with brick built beds, the property is approached by a grey brick path which is edged by twin lawns with a flowerbeds and a pebble garden as you approach the front door. The front garden has colourful shrubs providing year round interest and hedging to the sides which provide privacy. A wooden side gate leads to the courtyard garden to the rear which is open to the south and is a secluded and protected place to relax outdoors in the summer months being enclosed by attractive brick walls and raised beds. There is also a large garage with loft above excellent for storage.